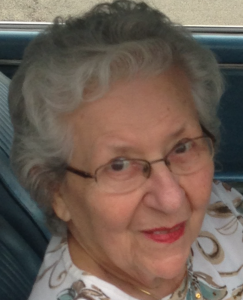 Mary Kathryn Bush McCoy, age 93, of Glen Ellyn, Illinois, formerly Washington C. H., Ohio and Pompano Beach, Florida, passed away peacefully on Wednesday, January 17, 2019. Mary Kay was born on April 4, 1925, in Washington C.H., Ohio to Wert C. and Ola W. Bush. She grew up in Washington C.H. and graduated from Washington High School. In 1945, she married her high school sweetheart, Edwin C. McCoy and together they raised four daughters Linda, Carol, Judith and Sandy on a farm in rural Fayette County. Mary Kay enjoyed her family and numerous close friends. She took great pride in her work as a data processor, tax preparer and owner/operator of E&M Tax Service. As a loving mom, Mary Kay always opened their home to friends of the girls, volunteered with PTA, Campfire Girls, taught Sunday School & Bible School and assisted with numerous school events. For her community, she served as a Red Cross volunteer, a voting poll worker, an active member of Lioness Club and Phi Beta Psi Sorority. She enjoyed boating, swimming and water skiing with her family and friends. Following their retirement, she and Ed spent their days traveling the country in their RV, finally settling in Florida to enjoy the warmer climate. Mary Kay was an excellent cook who loved to collect recipes and experiment with new foods. In her free time she enjoyed sewing, knitting, reading, and playing bridge with a group of lifelong girlfriends. Mary Kay loved life and was fueled by the love and devotion she had for being a wife, mother, grandmother and trusted friend. Mary Kay was preceded in death by her parents, Wert and Ola; her loving husband of 63 years, Eddie; her daughter, Carol Sue McCoy Shaw and her sister, Ruth, and brother-in-law, Charles Baldwin. She is survived by her loving family including her daughters, Linda (Jack) Reeves of Woodburn, Oregon, Judith McCoy of Columbus, Ohio, Sandy (Glen) Shute of Glen Ellyn, Illinois; her grandchildren, Megan (Nick) Lashutka of Columbus, Ohio, Rob Teeters of New York, New York, Michael (Krissy) Shute of Bisbee, Arizona;, Michelle (Jacob) Felten of Oswego, Illinois, Sarah Shute of Baltimore, Maryland and Eric Shute of Denver, Colorado; great grandchildren, Kuyper, Duke, Ike & Drake Lashutka and Addison, Ryan, & Benjamin Felten; nieces, Marcie (Chuck) Ware of New Richmond, Ohio and Kathryn (Ken) Back of Amelia, Ohio as well as other nieces, nephews and cousins. She is remembered and deeply missed as a remarkable woman who lived a full and meaningful life. A memorial graveside service will be held Saturday, April 20, 2019, at 11 am at Washington Cemetery. In lieu of flowers, memorials, in her name, may be made to Grace United Methodist Church, 301 E. Market St., Washington C. H., Ohio 43160. Please join the family at the Highland House, 703 St. Rt. 41 SW, Washington C.H., Ohio from 12:30 p.m. to 3 p.m. on Saturday April 20, 2019 in celebration of a life beautifully lived. Local arrangements are under the direction of the Kirkpatrick Funeral Home in Washington C.H. Roger Kirkpatrick, thank you ever so for you post.Much thanks again.